Norton Power Eraser is a free virus removal tool that can be downloaded and run to remove malware and threats from your computer. You can run this tool to scan for threats even if you have a Symantec product, or any other security product. If you cannot start the computer in Normal mode, you can run this tool in Safe mode. Norton Power Eraser is easy to download, and scans your computer quickly to detect the most aggressive computer viruses. You don't need to install this tool. The Norton Power Eraser tool is compatible with computers running Microsoft Windows operating systems only. It does not work with computers running on Mac OS X.
Norton Power Eraser uses aggressive methods to detect threats, and there is a risk that it can select some legitimate programs for removal. You should carefully review the scan results page before removing files. If you accidentally remove a legitimate program, you can run Norton Power Eraser to review past repair sessions and undo them. Norton Power Eraser checks for and downloads the new version if available. By default, Norton Power Eraser performs a Rootkit scan and requires a system restart. When you see a prompt to restart the computer, click Restart. If you do not want to include the Rootkit scan, go to Settings, and uncheck the option Include Rootkit scan (requires a computer restart). When Norton Power Eraser completes the scan, it displays the scan results. 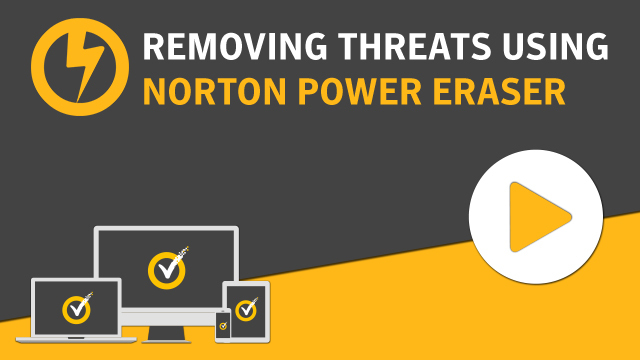 The items that Norton Power Eraser considers as risks, display the status as Bad and recommended action as Remove. The items that require further review display the status as Unknown. If you see No Risks Found, Norton Power Eraser did not detect any risks on your computer, click OK to exit. If you see any files that are listed as Bad, the Remove check box under Action is checked automatically. It is recommended to remove these files. If the Cloud Scan result shows Not a Known Threat, do not click the Remove check box. The file may not be a threat, and needs further analysis. Make sure that Create System Restore Point before proceeding with fix check box is selected. If you are asked to restart the computer to complete the removal, click Restart Now. After successful removal of the risk, click Done. Are you a Virus Removal Assurance subscriber?